Home | Adventure Notes | Is It Tornado Season Where You Live? Spring is here! It’s time to leave the mittens and heavy coats behind, enjoy the budding trees and blooming flowers, and also be aware of severe weather. That’s right, springtime is tornado season across much of the United States. But it depends where you live. That’s one of the many things I learned while researching my newest book, The Tornado Scientist: Seeing Inside Severe Storms. This new addition to the SITF series just came out last month! Tornadoes are storms of violently spinning air spawned from powerful thunderstorms. The storms that produce severe weather, including tornadoes, are powered by warm moist air rising up into the atmosphere. That’s why winter twisters are rare in cold places like Minnesota but happen in the warmer South. This terrific UStornadoes.com map shows where tornadoes have occurred by season. What is the prime season for twisters where you live? More importantly, are you and your students prepared for a tornado? Remember, a TORNADO WATCH means a tornado is possible (“watch” TV or other media for updates) while a TORNADO WARNING means a tornado is likely happening (“warning”: take shelter now). BEFORE: Have a school and/or family plan. Everyone should know where to go and what to do. Make sure an emergency kit is stocked and easy to get to. AFTER: Watch out for broken glass and nails (shoes! not flip-flops) and never go near loose power lines. Text, don’t talk to communicate to leave phone lines open for emergency workers. Use this simple quiz to start a conversation with students about staying safe during severe weather. 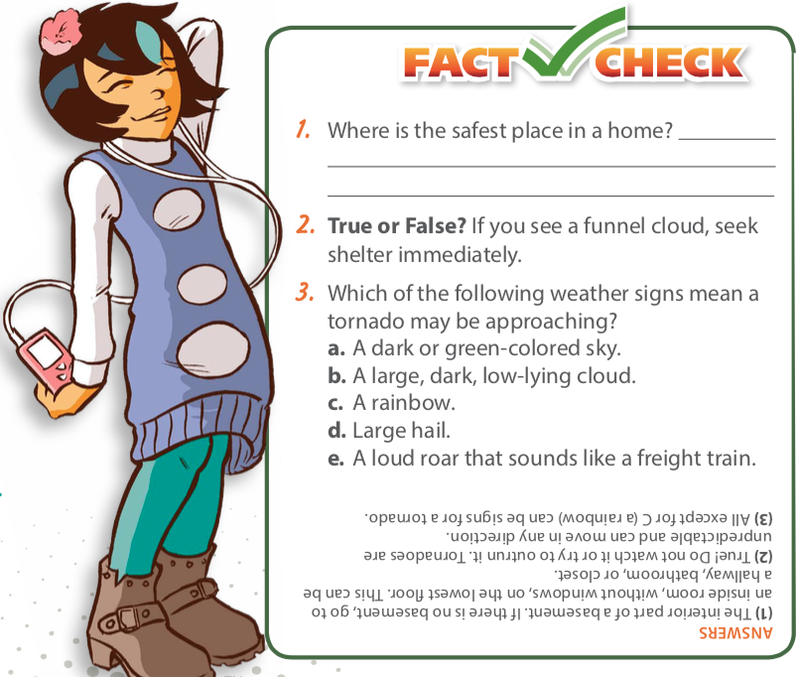 It’s part of a downloadable Tornado Fact Sheet for kids from FEMA. Be safe and happy spring! Mary Kay Carson and Tom Uhlman are the author and illustrator of Emi and the Rhino Scientist and The Bat Scientists. Mary Kay has written many books for children and Tom has been a freelance photographer for twenty years. They live in Cincinnati, Ohio, with their dog Ruby where they wait each summer evening for the bats to begin circling above their backyard pond. Tom also shot photographs for Eruption!, a Scientists in the Field book about volcanoes by Liz Rusch. Mary Kay and Tom's upcoming Scientists in the Field book is Park Scientists: Gila Monsters, Geysers, and Grizzly Bears in America's Own Backyard, which is about America's National Parks.